It is believed, by some, that The Holy Ka’bah, located in Makkah, Saudi Arabia, was first built by Adam (Peace be upon him), the first man, first Prophet in the worship of One God, that it was forgotten for many years, and was later found by the Prophet Ibrahim and his son Ishmael (Peace be upon them both). However, most scholars are of the opinion that the Ka’bah was first built by Prophet Ibrahim and his son Ismael, and not by Adam, as commanded by Allah. The Ka’bah was the first structure ever built solely for the worship of the One God, Allah SWT. Thousands of years later, Muslims from every corner of the Earth turn towards the Ka’bah 5 times a day (at the minimum) to perform their 5 obligatory prayers. This week, marks the beginning of the Holy Month of Dhul Hijjah. It is during the first 10 days of this month, each and every year, that thousands upon thousands of Muslims visit the Ka’bah as part of the ritual of performing Hajj. Hajj is one of the 5 pillars of Islam, along with Shahada (declaration of faith), Salat (5 daily prayers), Zakat (Charity), and Saum (Fasting during the month of Ramadan). 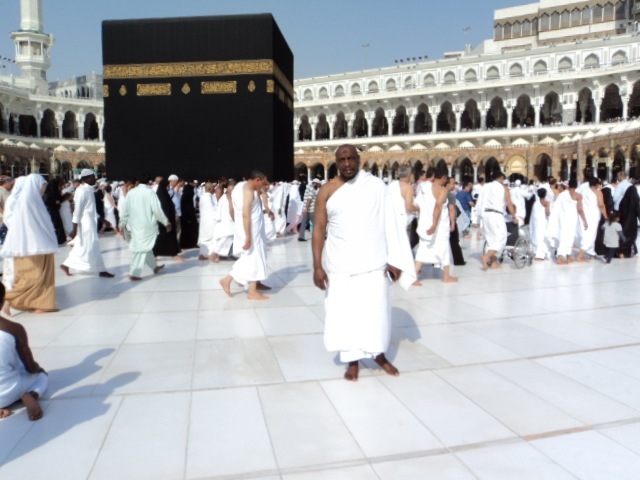 Hajj (pilgrimage) is incumbent upon all able bodied Muslims once in their lifetime. 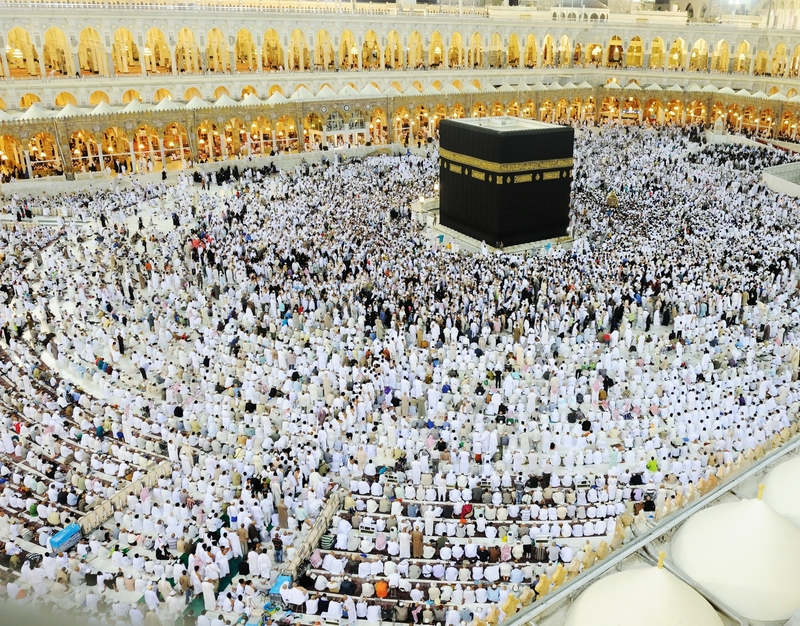 Muslims are free to perform Hajj more than once, however once is the obligation. To perform Hajj, one must be physically and financially able to go which includes being sure that your family is provided for, and not suffering, while you are gone. Woman must be accompanied by her husband or a Mahram to perform Hajj. If she does not have a husband or a Mahram , Hajj does not become obligatory for her. A mahram is a male, whom a woman can never marry because of close relationship such as a brother, a father, or a sibling. As one can see from this Ayat from the Qur’an, if someone has the ability to perform Hajj and they choose not to, they are seen as disbelievers by Allah. No Muslim should take this lightly! Start putting money aside, start a “Hajj fund”, save your pennies, plan! Just last week, I was assisting with a recent Sunday school Islamic Studies class and the subject was the importance of performing Hajj. A student shared that she knows a recently married couple who chose to go to Hajj for their “honeymoon.” SubhanAllah, May Allah accept this couple’s Hajj. They could have easily spent their money on a traditional honeymoon, as many young couples do, travelling through the Caribbean or Europe, but they chose Hajj instead. May Allah continue to guide them. Ameen. Hajj happens once each year, however, Ummrah (the “Lesser Hajj) can be performed at any time of the year. The holy month of Dhul Hijjah is now upon us, and it is during these first most blessed days of Dhul Hijjah that pilgrims from across the globe make their way to Makkah to perform the rites of Hajj. I was able to perform Ummrah during a brief stay in Jeddah, Saudi Arabia, and as I think about all of the Muslims currently making their way towards Makkah and towards the Ka’bah, I can recall my own emotions as I visited the Ka’bah for the very first time and I know what Muslims visiting the Ka’bah for the very first time will experience over the next few days. It is hard for me to find the right words to express the emotion that one is overcome with when they see the Ka’bah in Makkah for the very first time. It is hard to convey the emotion, especially to a non-Muslim. How can a building in the shape of a cube draped in cloth (The Ka’bah), this simple concrete structure, evoke such emotion? You see, it is not the structure itself, it is what this structure represents. The experience is profound. As you enter the Mosque, you are first struck by the columns and arches that you pass by as you make your way towards the Ka’bah. You feel as if you have stepped into a different space in time, you notice people ahead of you, people on both sides of you, and people behind you, all there with one shared belief. A feeling of intense awe begins to overcome you as you are struck by the realization that millions of people have walked the very same path as you. The same path that Prophet Ibrahim (AS) walked, the same path that Prophet Muhammad (SAW),his family and his companions all walked so many many years before us. And, each and everyone of us is there for the same purpose, to worship Allah (SWT). 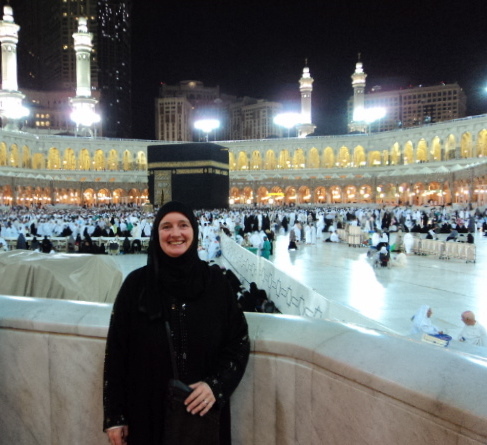 As I walked towards the ka’bah, my emotions were intense. I was walking and searching for the first sight of the Ka’bah. My eyes were intent on seeing it yet I wasn’t sure if I was ready. My dear friend Amina who, along with her husband and young child, brought me there for my first experience, said to me “Ok, get ready, you are going to to see it soon.” And then……it happened. 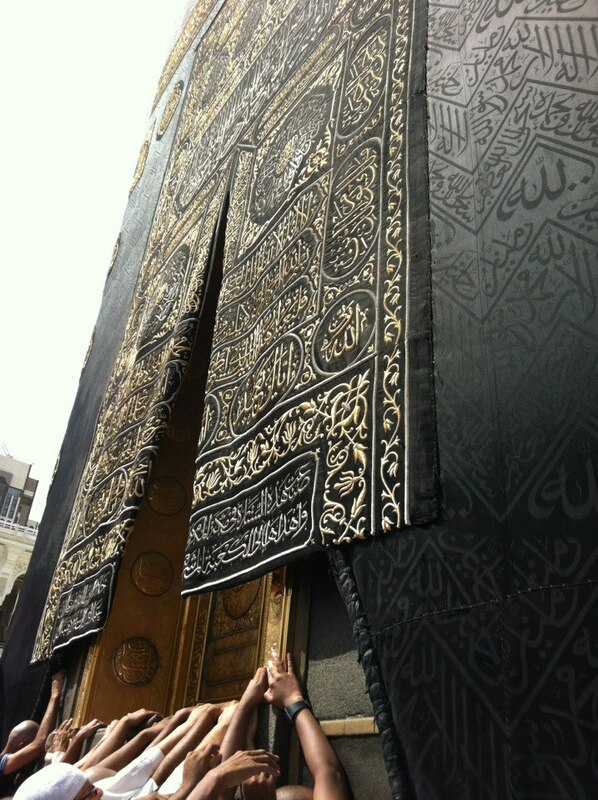 My eyes filled with tears, as I caught a small glimpse of the black covering which drapes the Ka’bah, I began to tear up and shake with emotion, intense happiness, intense awe, intense sadness that I wasn’t able to share the experience with my loved ones at home, along with intense overwhelming gratitude. I was not yet ready to fully experience it, I quickly looked down and stepped to the side to let people pass as I made du’a to Allah and to let the tears flow. I felt as though if I looked up towards the ka’bah again, I would realize that I was in a dream. I took the chance…I looked, and it was still there, I could still catch a glimpse of the black cover. I quickly stepped to an area to pray 2 rakah as a prayer of greeting for the Mosque and to thank Allah SWT for allowing me the opportunity to be there, and to make du’a and seek forgiveness. A place where many people will experience what I experienced. Once you have taken it all in, performed the rituals of Hajj or Ummrah, and are able to begin to observe others, you share in their experience. 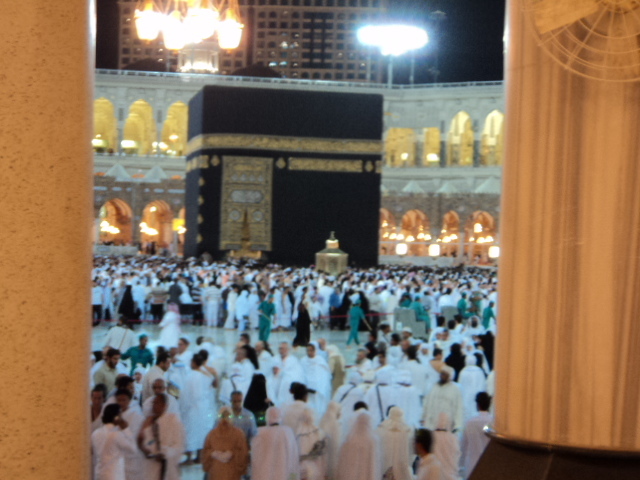 You see, as people walk towards the Ka’bah and suddenly catch a glimpse…the emotion! The tears, the amazement, the awe! You quickly remember that feeling. The feeling that I am experiencing right now as I think about the millions of Muslims who are going to experience this feeling right now. When preparing for Hajj, pilgrims enter a state of ihram where they make their intentions to perform Hajj to Allah SWT and exchange their everyday clothes for two pieces of white cloth as their clothing (men only) just as Prophet Ibrahim (AS) did during earlier pilgrimage. Men are no longer seen as a businessman, a wealthy person, a prince, a poor person….all appear the same, equal under the eyes of Allah (SWT). They are all humble servants of Allah. This is happening right now, as I type, many Muslims are reciting these very words as they make their way to Makkah. InshaAllah, I will be able to go back to Makkah to perform Hajj at some point. However, even though many Muslims are unable to do Hajj, there are many things that we can do in observance of these blessed first days of Dhul Hijjah. The Prophet Muhammad (SAW) said, “There are no days of the year in which righteous deeds done in them are more beloved to Allah than the first ten days of Dhul-Hijjah!”What are good deeds that we can do during these first 10 days? Fasting on the day of Arafat (9th of Dhul Hijjah) If you fast on this day, your sins will be forgiven for the year before and the year after. Dzikr. 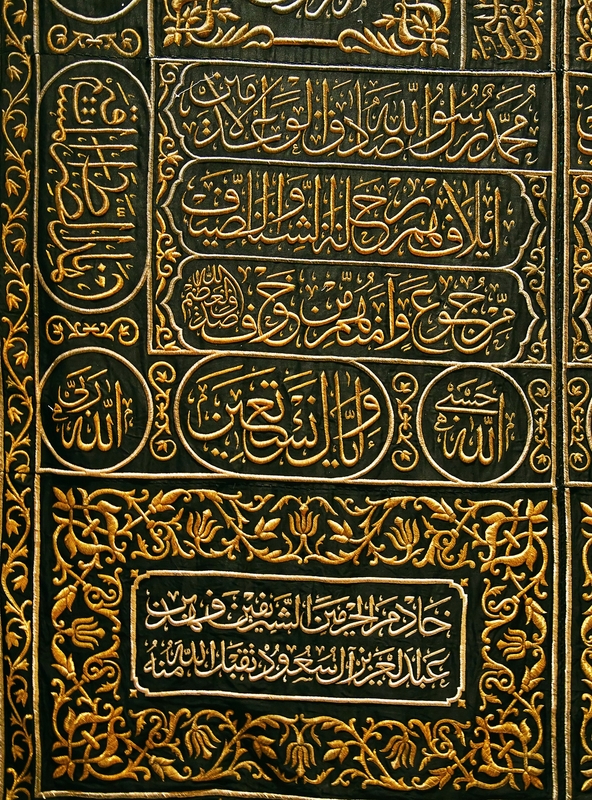 Remebrance of Allah. Saying “Allahu Akbar” “La illaha illAllah” “Alhamdulillah” often throughout the day. sacrifice an animal for the Sake of Allah SWT. After Eid. It can be done on the 10, 11, 12, or 13. Whoever sacrifices an animal, all sins to the amount of hair on the animal will be forgiven. Pray the Eid al Adha salat (10th day of Dhul Hijjah). Eid al Adha is to commemorate the end of Hajj and to remember the willingness of Prophet Ibrahim (AS) to sacrifice his son to Allah SWT. Appreciate the blessing of Allah and come close to Him during these 10 days through all of these acts with intention, thought, appreciation, prayer, and seeking forgiveness. May Allah SWT accept everyone’s Hajj, Du’a, and acts of worship. Ameen. This entry was tagged holy kaaba, islam. Bookmark the permalink. ← In response to the recent violence. What would Prophet Muhammad (SAW) do?